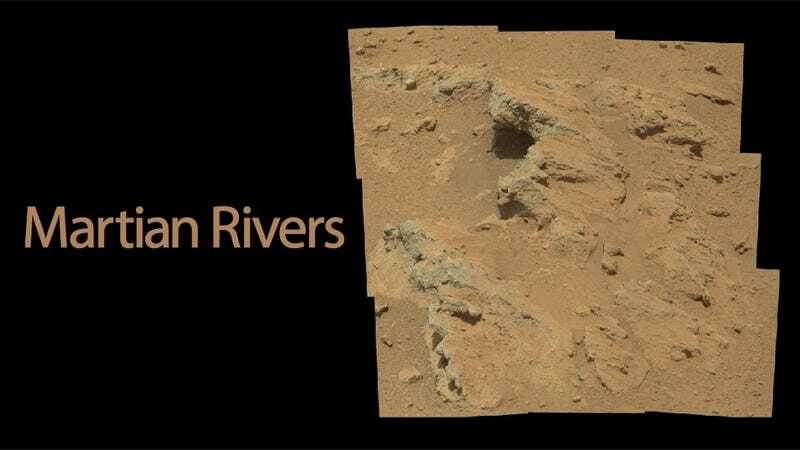 NASA's Curiosity rover has found evidence of an ancient riverbed on Mars. While it's now dried up, it's the first ever evidence to prove that running water once poured over the surface of the red planet. This is huge. The picture above shows a rocky outcrop which a team of NASA scientists has named "Hottah", after Hottah Lake in Canada's Northwest Territories. It doesn't seem much, but what you're looking at is exposed bedrock, the kind that you find at the bottom of a river. The bedrock itself is made up of smaller fragments of rock cemented together—what geologists call a sedimentary conglomerate. In the past, it would have looked flat but the scientists think it must have been disrupted, maybe by meteorites, to give it a slant. The site lies between the north rim of Gale Crater and the base of Mount Sharp. "From the size of gravels it carried, we can interpret the water was moving about 3 feet per second, with a depth somewhere between ankle and hip deep... This is the first time we're actually seeing water-transported gravel on Mars. This is a transition from speculation about the size of streambed material to direct observation of it." "A long-flowing stream can be a habitable environment. It is not our top choice as an environment for preservation of organics, though. We're still going to Mount Sharp, but this is insurance that we have already found our first potentially habitable environment."